As visitors enter the Centro de Interpretación Olivar y Aceite – the Olive and Oil Interpretation Center – they walk into what at first glance appears only to be a shop. However, this is not any museum gift shop. Located in Úbeda, a small historic town in Jaén, it is a sort of temple to olive oil. At the Interpretation Center, dozens of local olive oils are on offer, from Picual to Hojinlanca to Arbequina, presented in bottles with pink foil, scenes of birds or abstract designs. There are olive oil cosmetics and lotions, chocolate bars made with olive oil and cookbooks featuring the region’s main lifeblood: olive oil. 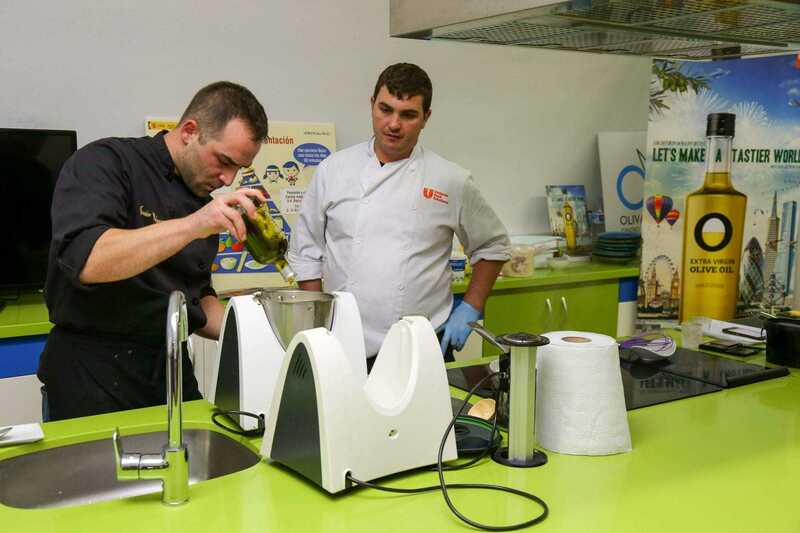 For the last five years, this multifunctional space has been a hub for Jaén’s olive oil sector, where it offers tasting workshops, cooking classes and demos, and professional trainings on Corredera de San Fernando, a few minutes’ walk from the Parador, a sixteenth-century Moorish Palace at the center of Úbeda. The museum is run by the Olivar y Aceite Association, a nonprofit organization whose objective is the promotion of Jaén’s olive oil. It is housed in an olive mill that was built in the 1930s. It makes sense that visitors to the area will want to learn about olive oil. The “liquid gold” dominates the region’s landscape, economy, and culture. Whether they enter by train or car, any visitor will notice olive trees stretched before them for miles, planted in straight rows, with silvery leaves reflecting the sunlight. Olive groves cover gentle rolling hills which turn into mountains. More than 220 million olive trees flourish in Jaén, the world’s largest cultivated surface area. Spain is the king of olive oil production, and the region produces more than 40 percent of Spanish olive oil, and a fifth of the olive oil in the entire world. Visitors can take a tour that showcases nearly every aspect of olive oil. A guide will begin with the olive groves themselves – olive trees grow in the museum’s garden – through to the production process of the olive oil. Visitors will see both historic and modern mills, along with photos and videos that explore the history of olive oil in the region. They will learn about its place at the heart of local gastronomy and its numerous and powerful health benefits. They will also taste through several oils and get a crash course in sensory analysis as well as detecting attributes and defects. At the Interpretation Center, there really is something for everyone. Visitors can embark on a tour of nearby olive groves. Workshops are offered for kids of all ages. Tastings and trainings are held for beginners, experts, and professionals. The Center hosts events for both tourists and the local community. They also offer “oleoturismo” packages where visitors can see mills, producers, and restaurants throughout the region. More than 25 different olive oil classes are taught each year, and the tasting club brings together amateurs and professionals to taste through local oils. An undisputed highlight of a visit to the Interpretation Center is downstairs, where the Center hosts what they call “show cooking.” It is the end of the journey for the olive oil, and visitors can watch local chefs cook both traditional and modern creations, and then enjoy the resulting flavors. Olive oil stars in the region’s quintessential dishes, such as cochifrito, succulent pork meat fried in garlic and olive oil, rich lamb stew, and rabo de toro, bull tail braised in olive oil and red wine. When Olive Oil Times visited in November, Chef Javier Blasque served foie gras with white chocolate and plum cake. The dish was served with a syringe of Picual, whose spicy, bright flavor cut through the richness beautifully. A mousse of wild mushrooms got a smooth kick from Arbequina olive oil and a sweet crunch from pomegranate seeds. For dessert, Blasque created an emulsion of 30 percent cocoa butter and 70 percent Arbequina extra virgin olive oil, which he used to make both rice pudding and a fluffy olive oil cake. “There really are endless possibilities,” Blasque said as he passed out small slices of his still warm cake.